For the most part I'm usually satisfied with the products I buy. I'm not typically a early adopter and will usually lag a year or so behind a release of something new. I do my due diligence and research products I am interested in, read reviews from people I respect and watch videos about said products. Because of this I'm not usually dissatisfied which is why there aren't many negative reviews or comments here.That doesn't mean I'm never dissatisfied, I just tend to stay away from junk. At the same time, there are occasions where I'm surprised, either at how bad or how good something came out. I've been burned in the past on custom forged steel and more so than knives, axes and hawks that are forged. 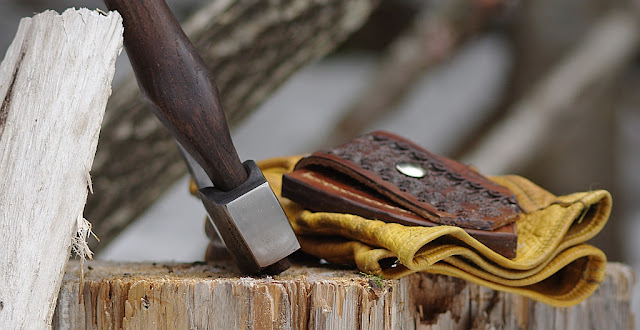 I'm a little nervous about forged axes, hatchets, and hawks, there's a whole lot of craft in a forged head, and I personally think they are quite a bit more difficult to get just right than knives. When dealing with that amount of steel, the heat treat is critical, and considering these types of tools are going to be used 'chopping' wood that sometimes will be frozen a la winter in Minnesota for example, well let's leave it with there is a lot riding on a smith's heat treat. It has to be right. 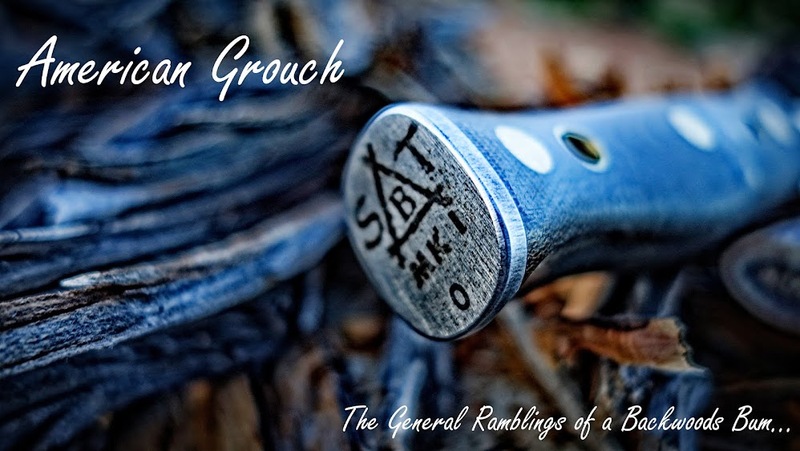 Not long ago I contacted Lisa West from Wolf Creek Forge and we began discussing what I wanted. Not a full size axe, and not one of those mini-hatchets either. I've owned a few of those and ended up giving them away. I also wanted something longer than the Small Hunter's Axe from Wetterlings that has an overall length of 15". While that 'camp axe' as I call it has served adequately over the past couple years it just didn't ring with me the way I like my gear to do. Guess that sounds odd but to me it isn't. I can try three or four items, closely matched to one another and all service the same role, and find that there's always just something about one of them that 'rings'. A camp axe to me means it's packable but still of sufficient length to be used as an axe. While no 'camp axe' is going to be a full time feller or forest axe, the size has proved to me that it can serve as needed, when needed. 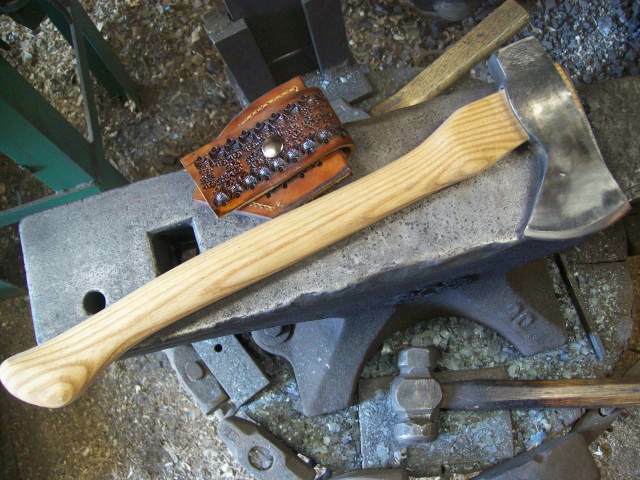 In this case the axe I commissioned came out with an overall length of 17". I've owned the large hunter's axe, at 19" and the small that had an overall length of 15", one too long and one too short. 17" was the Goldilocks size for me, for my particular packs and uses this size is ideal, it probably sounds crazy that 2" of length can make that much difference, to me it does. For longer periods of time in a static camp I do make use of a 31" axe, but for the most part it is seldom used. I've found for my fire wood needs a bucksaw and a 'camp axe' are more than adequate. 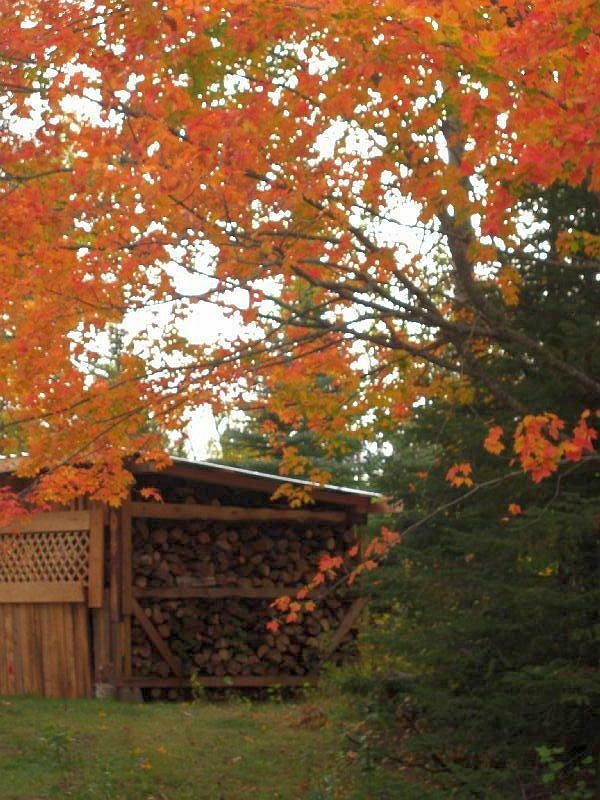 Every year I cut eleven cords of wood, we heat the home exclusively with wood. I don't cut that wood with an axe of course, that's what the Husqvarna chainsaws are for. I do use axes in the process though, sometimes for limbing, sometimes for places I can't or don't want to use a saw, I use axes quite a bit actually, but I'll never tell you I'm any kind of expert. 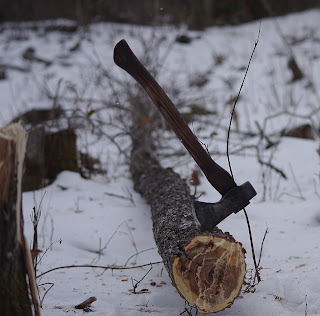 I use an axe as a tool, it has no mythological properties, its use is not a mystery wrapped in an enigma. It's a piece of sharp steel on stick for Pete's sake, man's been using them for a very long time. 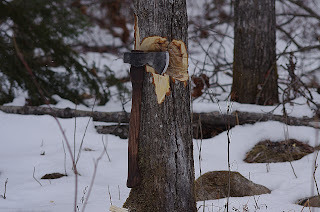 You don't have to be an old time logger to know your way around the axe, I will however go out on the proverbial limb and state it takes more than a few whacks on the fallen tree in the back yard to an aficionado make. 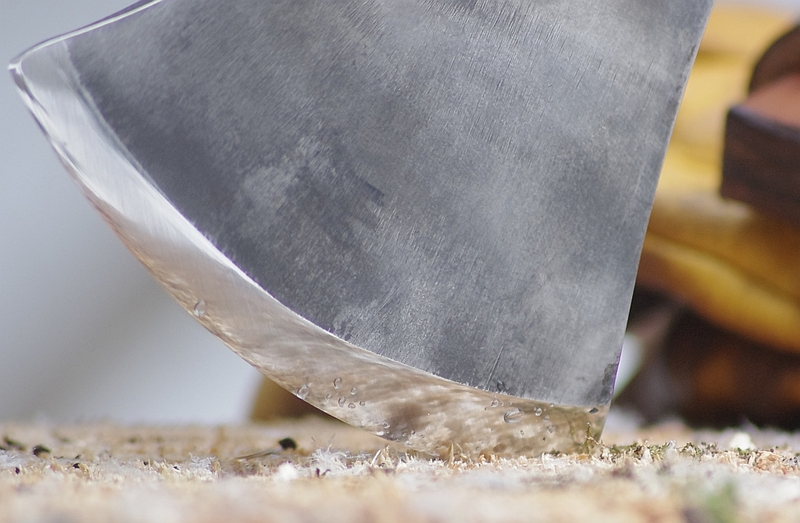 The next time you're perusing 'how to use an axe' videos, just pay close attention. If you can push the 3" diameter tree over with your bare hand, you don't need an axe, and no, such a tree doesn't make for a good demonstration. There's a whole subculture of axe aficionados out there, and while I'm a big fan of each to his own, it would be nice if many of the aficionados actually used an axe regular like, it would bring some validity to their observations, as I never did understand how a person can review something they don't actually use. There comes a point where 'theory-crafting' hits a wall, usually it is at the intersection of the writer pontificating and the reader realizing the writer has no credibility. As for me, I'll tell you to take my writing and observations as nothing more than the ramblings of a woods bum, admittedly one who does indeed spend more than a bit of time 'out there'. I'd encourage you to do your own testing, actually use things, that's the only way any of us ever really gain any skill, by doing it. Not talking about it, as fun as reading some of it might be! 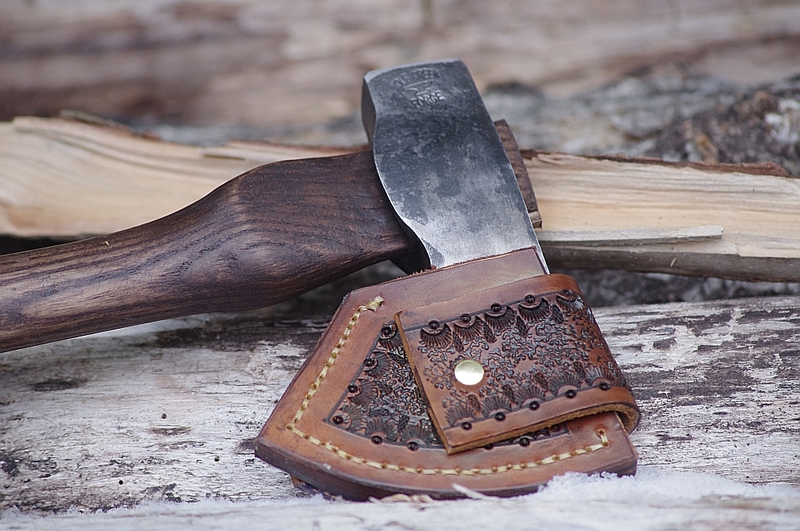 The camp axe that Lisa worked up is a rather elegant and robust version of my vision of a packable camp axe. Execution is terrific, the steel excellent, and out of the box had one of the sharpest edges I've received in any blade in the past five years. The edge is truly fine and polished to mirror like luster. She took the following photographs before shipping the axe to me. The ash haft was hand shaped, a lot of time went into that and the tooled mask. From the pictures I knew I was going to like it, when I got it I was quite surprised at just how much. I spent some time on it with a leather dye and some pure beeswax. After a time, this is the result. Forged from 1060, the poll face was heat treated the same as a normal hammer face, good surface area, wide and tall enough to actually be of use. The edges are rounded, sloped, this is handy when removing a deer hide while not damaging it. Using the poll to pry, push and otherwise move the hide from the carcass. I saw it written somewhere that this was excessive, that maybe for game larger than deer. It was just another telling point coming from a writer who'd never actually done it. See, skinning a deer with a knife is fine, but you're going to cut too far into the hide, leaving a hole. Many experienced folks do this, much less someone with little experience. No, the point isn't the size at all, something that utterly escaped that writer, using the poll on a handy axe means you're taking the skin off without damage, while keeping the meat on the meat and not on the hide, which helps later when you are working that hide into leather, hair on or off. The best hides I've ever seen were not 'skinned' from the carcass, they were 'polled' off, and were actually done quicker than an experienced hand with a knife. Another one of those 'if you haven't done it, you probably shouldn't pontificate on it' comments. I did not want the typical handle, I am not a fan of modern axe handles. I despise the overly aggressive curve in the grip, it is entirely over exaggerated in most modern handles. I don't find them comfortable and I know they cause accuracy issues. In point of fact, I am not the only one who believes this or has observed it. The following is from "Keeping Warm with an Ax, A Woodcutter's Manual", by D. Cook, 1981, Universe Books, page 90, he articulates the issue much better than I do. "The axis of pivot for a straight-handled ax lies in the center of the handle throughout its entire length from end knob to top side of the eye. "But with the curved handle, any rotation is controlled by the chopper’s hands grasping the lower curve at the grip. Therefore the real axis of pivot does not pass through the ax head at all because the 10 degree bend of the lower handgrip is not pointed in that direction. The effective and real axis lies in an extension of the grip and passes somewhere to the rear of the entire axhead. "The trouble-making grip with its 10 degree bend subtends an arc of 4½” at the handle's residual length of 25". That means that the curved-handle axe already has a constructive "foresection" of 4½” behind what we have hitherto termed the “axis of pivot”. But there is also an additional 4½” waiting at that point. Remember, we stated that each ax has a fore-section distance of 4½” forward of the axis of pivot (by the string-suspension method). For curved-handle ax then, the constructive fore-section length between the real axis of pivot and the bit is: 2x4½”, or 9”. "So the ax with a curved handle will act as if it had an imposing bit 9” long. For a rotation of only 5 degrees, its bit will swing .78”, exactly twice what that same ax would deviate if hung on a straight handle. Greater rotation would bring greater deviation in the same proportion. This is the most damning case against the curved handle. It is substantially less accurate than a straight handle. "However, the human body is a marvelous machine. It can adapt to nearly anything. If the handle of a golf club were shaped like a pretzel, some people would still play golf. A chopper soon adapts himself to a curved ax handle even though that handle is designed to frustrate accuracy. The chopper acts as if there were a straight axis throughout the entire length of the handle, even though there is not. "But this unconscious adaptation has a price. Use of the curved handle requires more practice to cut well. And even with practice, the chopper cannot attain the results possible with a straight handle. In our history, this is at least partially confirmed by the woods professionals of the era when trees were felled with axes. These men graduated from single-bitted axes on straight handles to double-bitted axes, also on straight handles. 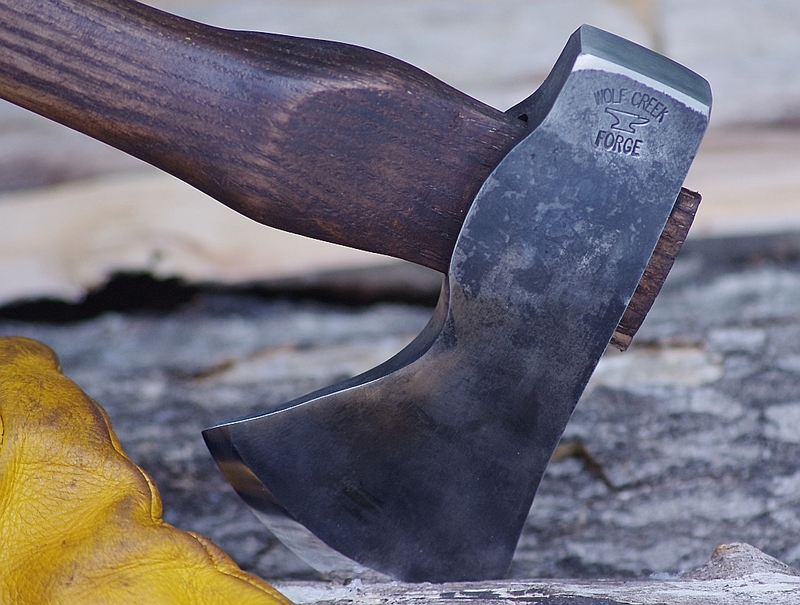 Curved ax handles do not seem to have ever attained widespread professional acceptance." And so, I prefer straight handles as a result. In this case the the haft swells at the bottom, the spine is straight. Accuracy is fantastic, feel and comfort are twice if not thrice that of my comparably sized Wetterlings. In short, I've not held another axe in the past decade that I've enjoyed using more than this one. It is for me, superior to the Gransfor Bruks, Wetterlings, S&N, Husqvarna, and Hultz Bruks axes that I've owned and used in the past. Some of it is related to the haft, but the thickening in the center of the face, tapering down also heavily contributes. Turns out I'm not the only one that thinks that either, while somewhat winded this piece on Axe Face Geometry is worth the time to read in my opinion. Even though I'm talking a camp axe here and not a felling axe the convex'd faces matter. I'm not saying convex edge, I'm referring to convex faces, thicker in the middle and fading out. To this point I'm happy with the camp axe from Wolf Creek Forge, you can be sure you'll be seeing more of it in the future, it will actually be used and regularly so. I don't use axes very much and certainly not for felling. I used to, but not for a long time. 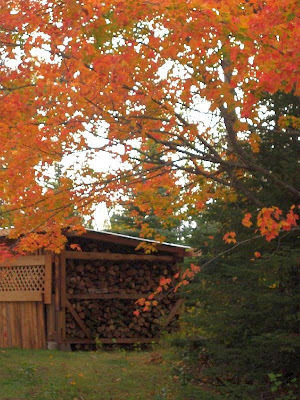 If I use an axe, it will be for limbing or splitting. Most of my axes are 27" length and have a slightly convex blade. 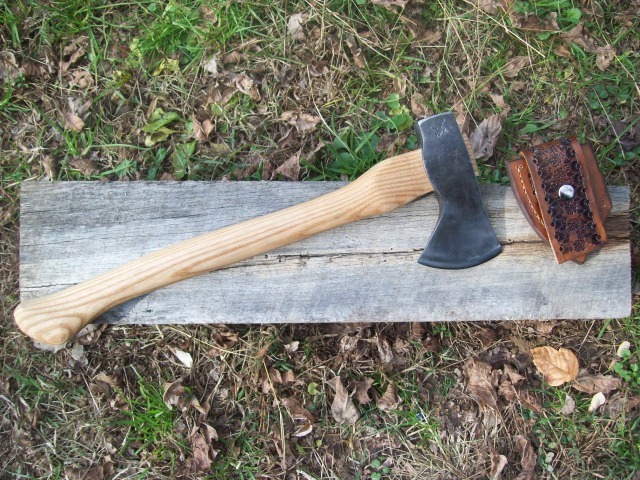 Of the two axes that I most commonly use, one has a pretty heavy head and is best suited to splitting while the other has a lighter head, a boy's axe, and is better suited for limbing and for splitting in camp. Your new axe appears to have a flat bevel on the edge. Is that the case? I have always sharpened my axes with a convex bevel. I recently acquired a Razorback boy's axe. Although this axe appears sharp, it has no bite. The edge has such a pronounced convex bevel that it appears to bounce off the wood rather than cutting it. I'll admit that I have only used it once, but I started thinning the bevel as soon as I got it home. I'm thinking about putting what would amount to a scandi edge on this axe head. A 30 Degree angle should give plenty of bite, but I don't know how well it would hold up. It doesn't much matter, because the axe isn't much use to me in its present shape. I've not measured the bevel it's almost convexed in nature, and in fact all I've done to maintain the edge is some stropping. In the pictures above, the 3rd from the top, and the 3rd and 5th from the bottom are of the first tree I dropped with this axe. I should have captured some pics of the chips for they were larger than 50 cent pieces. I had the face opened and the back cut done from start to finish with the tree on the ground in less than five minutes. There was no bouncing but neither was there any wedging, it wasn't sticking and it wasn't bouncing. "I use an axe as a tool, it has no mythological properties, its use is not a mystery wrapped in an enigma. It's a piece of sharp steel on stick for Pete's sake, man's been using them for a very long time." That's a purpose-built axe if ever I've seen one. How much did that wee lovely set you back? I live in KY and would love to give a local smith some work! $135 and well worth every penny. Very nice new ax, or is it axe? Nice review AG- Looking forward to more. I suppose that axe vs ax debate will grind on for eternity eh? Axe is used throughout the non American English speaking world, however, my grammar teacher way back in the day taught me the spelling was axe, as opposed to ax. Old habits die hard I suppose. Now that's a nice tool! And for $135, you could almost call it a steal, considering the labor and skill that goes into something like that. She's made some killer stuff sure enough. 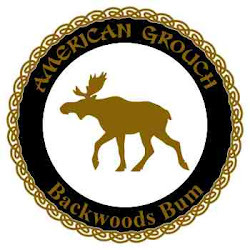 They don't put everything on their site, they've been listed several items through their BCUSA vendor forums but you've got to be quick as they sell out fast. Some really nice striker and fire kits, plus some custom one off stuff. They were great to deal with too. Love the color of the handle. I don't like the brand new plain wood look and have been debating on darkening my handle but didn't want it to look cheesy. May have to look into leather dyes. Thanks for sharing! I used Fiebing's Leather Dye. Went heavier near the head, and on the end, lighter through the middle, applied with a bandanna. Once set I took a chunk of natural beeswax and rubbed it into the handle. Put on a pair of leather gloves and proceeded to rub the wax in, friction heat helping it get into the wood. After a while I switched to a tight weave cotton cloth and do the same thing. This got rid of the tacky feel, smooth and slick now. Works pretty good in my opinion. Wow, beautiful axe. Not familiar with Wolf Creek so thanks for posting this.